Artromot and OptiFlex Knee CPM and accessories. OptiFlex-K1" - Simple, Durable, Reliable. Weighs just 23 lbs (10.4 kg), making it the lightest knee CPM on the market. Only 38 inches (97 cm) long. Wide low-profile, closed-base frame for stability. Faster motor speed. Single screw drive. Reversible footplate for shorter legs. ROM -10 to 120. On-board power supply. Patient lockout feature. Accommodates patients 4 ft to 6.6 ft (1.2 m - 2 m). Continuous Passive Motion is a postoperative procedure designed to aid in the recovery after joint surgery. After extensive joint surgery, if a patient fails to move their joint, the tissue around the joint will become stiff and scar tissue will form, resulting in a joint with limited range of motion, which often takes months of physical therapy to recover. 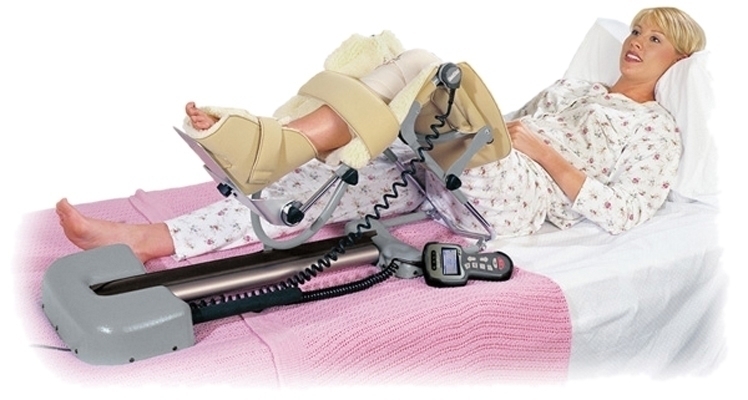 OptiFlex-K1" Knee CPM has interchangeable hand controls for maximum versatility. Dimensions: 38" x 9" x 14"